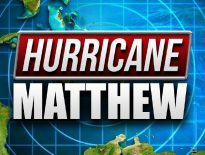 Post-tropical cyclone Matthew continues to speed away from the U.S. mainland at a rate of 15 miles per hour, but its impact was definitely felt here in Sandbridge over the last two days. 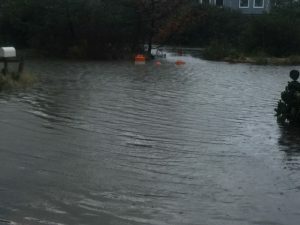 Sandbridge Road still had water blocking normal access on Sunday afternoon, but winds are subsiding as evening is arriving and flood waters are starting to recede. Damage assessments and clean up can now begin. You can see from these pictures that the impact of Hurricane Matthew was definite in Sandbridge. 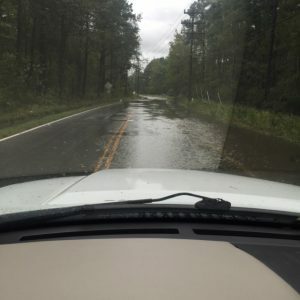 Here’s a picture of water across Sandbridge road taken earlier today. Flooding is most prevalent on the north end of Sandbridge as evidenced here above. 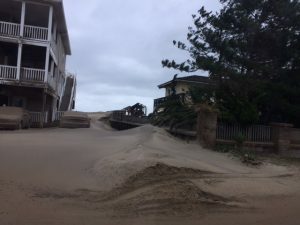 Lots of sand was moved around on the oceanfront as well which gives you an idea of the impact of the winds we received overnight. 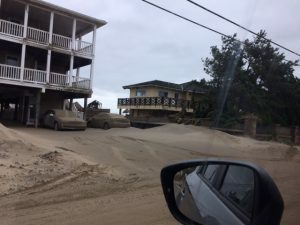 Take a look at the car in front of this house that is covered with sand. Several trees have been removed from Sandridge road by the Fire Station staff overnight, and power has been out to most of the properties since approximately 10 PM Saturday night. 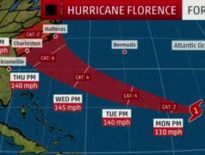 Sandbridge blue has been in touch with all guests in our property to ensure their safety and we will begin making damage assessments to our properties on Monday morning and contact any property owners impacted.